The Grand Balcon Sud hiking trail traverses the north side of the Chamonix valley, France. With views like this one, it’s no wonder why the trail is so popular. If we had to pick just one hike delivering awesome views of Mont Blanc, the Grand Balcon Sud would be it. Tip: Hike from the Grand Balcon Sud to a place called Lac Blanc. Spread out your picnic lunch, and pull out your wide angle lens. Enjoy the memories of a lifetime. 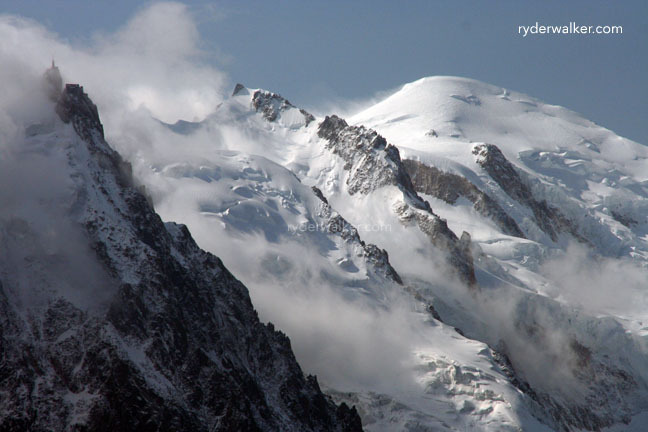 Ryder-Walker Guide, Ken Fuhrer, shot this photo on the last day of the Tour du Mont Blanc. He enjoyed these views again on day one of the Hiker’s Haute Route. Such is the life of a guide. Image: On left; l’Aiguille du Midi (3842 m). Right; Mont Blanc (4810 m).